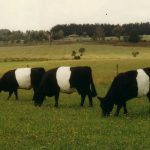 The distinctive ‘belt’ marks the naturally polled, adaptable and hardy breed of the Belted Galloway. 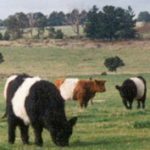 The Belted Galloway originated in South-West Scotland and adapts readily to the diverse Australian conditions. 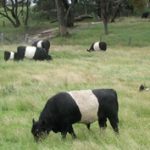 With colourings of black, dun and red, the distinctive white belt is a prominant feature of the Belted Galloway breed. 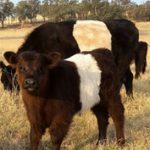 The adaptability and fertility, coupled with a long life span makes the Belted Galloway an excellent choice for your farming operation. There is no breed more distinctive!